Now that I’ve made a large batch of my own Power Cakes Pancake and Waffle Mix, of course I need to play around with ways to use it. Other than the obvious pancakes and waffles. That’s just so expected. 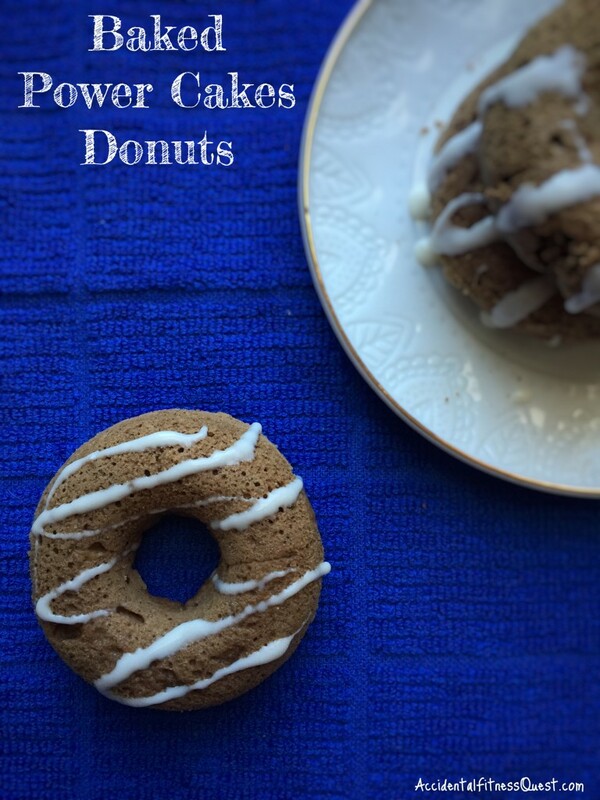 😉 Given my love for all things donut (do a search of my recipes if you don’t believe me), I had to make power cakes donuts as one of the experiments. Baked donuts are fun because you can have multiple donuts usually for the same calories as one fully loaded one. I’m still partial to the real thing but for quick and easy (AKA dunkable) breakfasts, you can’t beat baked donuts. These have a nice punch of protein, whole grains and fiber too. So grab your homemade batch of Power Cakes Mix and make yourself some dunkers! Preheat oven to 350 degrees and spray a 6 hole donut pan with non-stick spray. Mix all ingredients in a bowl until well blended. Fill each donut hole about 2/3rds full with batter. Bake at 350 degrees for 8-10 minutes. Remove from oven and cool before decorating or icing. Makes 2 servings of 3 donuts each at approximately 285 calories – 17g protein, 34g carbs, and 9g fat. I used my homemade version of power cakes. You can also go with the real thing and use Kodiak Cakes Power Cakes Mix. The butter I used is Smart Balance Original which is a dairy free butter substitute since The Kid has a dairy allergy. You can use a dairy based one or even peanut butter if you prefer. I knew I was going to top my donuts with a drizzle of powdered sugar and water, so I didn’t add sugar to the batter. If you like a sweeter donut or don’t plan to drizzle them, add up to 2 Tbsp of sugar to the batter before baking. This is the donut pan that I used, and in my experience you still need to oil or spray the pan with non-stick spray because it sticks every time. You can also make them as “donut holes” in a mini muffin pan. Get crazy with the toppings and mixins and have fun with this. Chocolate chips, blueberries, coconut. It’s a whole donut flavor world open to you. Let me know what flavors you try in the comments below. You’ve done it again! Made the Power Cakes Donuts just now! So good! I’m still on a lemon kick, so omitted the cocoa and added some True Lemon crystals, stevia drops, and 1/2 tsp lemon extract. Topped (while hot… couldn’t wait until they cooled off!) with vanilla protein/water/True Lemon crystals. Came out great! Thank you so much for the Power Cakes Mix recipe. I’ve been envious of all the people making things with Kodiak Cakes and now I can, too! I subbed out the flour cup for cup with all purpose gluten free flour and it’s perfect! Oh… and I used a casein/whey combo protein.